Sloths are several species of South American mammals of the familys Bradypodidae and Megalonychidae, of which the genera is represented by the living two and three-toed sloths. 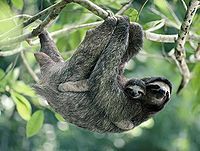 Living sloths use their clawed feet to hang upside down from tree branches, where they feed on leaves. The remarkably non-nutritious nature of such a diet may necessitate their habitual lethargy.The two-toed sloth is in fact so inert that symbiotic algae commonly grows in its fur, making it the only mammal that appears to be green. This, along with its typical motionlessness, affords it excellent camouflage in the trees. Along the ground sloths move especially slowly, at a rate of only approximately 6.5 feet per minute. Sloths defecate extremely infrequently (typically once a week). Yet remarkably, instead of just letting go from the treetops, they descend to the ground to use a single favoured sloth lavatory, which over the years may grow to mountainous proportions, exposing themselves to considerable danger in the process. Creation scientists believe that the sloth, like all ground-dwelling animals, originated in the Middle East. After the Great Flood, the species was probably dispersed by rafting which enabled it to colonize South America as part of the Post-Diluvian Diasporas.